For Windows Vista users, more than 12,000 movie titles and television episodes are now available to be streamed onto your PC, and watched instantly via Netflix through Windows Media Center. Microsoft has added Netflix accessibility directly in the Windows Media Center application, providing a Netflix section under the TV+Movies tab. This means that users are able to not only stream movies and TVs instantly through the application, but also manage both their instant and DVD queues, and search/filter searches through the entire Netflix library without having to open up a browser to access the site first. 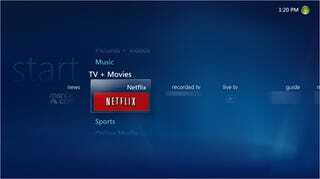 To further enhance the experience, these Netflix actions can also be controlled using any Windows Media Center-compatible remote control, allowing you to instantly watch movies without having to add them to your queue, and easily rewind and fast-forward during playback, thus transforming your personal PC into your own mini home entertainment system.